^ Paying the price for ignoring the real economy G. CHANDRASHEKHAR, The Hindu, 2008-04-18. ^ Inslee, Jay; Bracken Hendricks (2007), Apollo's Fire, Island Press, Washington, D.C., pp. 153-155, 160-161, ISBN 978-1-59726-175-3 . See Chapter 6. Homegrown Energy. ^ World in grip of food crisis. IANS, Thaindian News. 2008-04-07. ^ Burgonio, TJ. Runaway population growth factor in rice crisis—solon. Philippine Daily Inquirer, 2008-03-30. ^ World Population Information. United States Census Bureau. Data updated 2008-03-27. 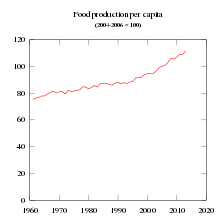 ^ Population annual growth rate, 229 countries 1955-2050 (UN Population Division's quinquennial estimates and projections). United Nations. Last updated on 2007-07-17. ^ "World cereal supply could improve in 2008/09", FAO: Global cereal supply and demand brief, Crop Prospects and Food Situation, No. 2., April 2008. The report notes that: "However, on a per capita basis, wheat and rice consumption levels decline marginally in the developing countries, mostly in favour of higher intakes of more value-added food, especially in China." ^ Are We Approaching a Global Food Crisis? Between Soaring Food Prices and Food Aid Shortage. Katarina Wahlberg Global Policy Forum: World Economy & Development in Brief. 2008-03-03. ^ "US recession is already here, warns Merrill"
^ Poll: "Majority of people believe recession underway"
^ Are We Approaching a Global Food Crisis? Between Soaring Food Prices and Food Aid Shortage. Katarina Wahlberg Global Policy Forum: World Economy & Development in Brief, March 3, 2008. ^ "As Prices Rise, Farmers Spurn Conservation Program" New York Times April 9, 2008. ^ ""Japan's Rice Auction Fails; WTO Paradox Bites"
^ Drought in Australia reduces Australia’s rice crop by 98 percent. The New York Times, April 17, 2008. ^ Food Prices Could Rise as Farmers in California's Prolific San Joaquin Valley Feel the Effects of Global Warming ABC News, August 5, 2006. ^ Crops lost due to unseasonal rains in Kerala The Economic Times, April 8, 2008. ^ Lower Crop Yields Due to Ozone a Factor in World Food Crisis Newswise, Retrieved on July 15, 2008. Two die after clashes in Egypt industrial town Gamal: Reuters, April 8, 2008. ^ Olle, N. 2008, 'Brazil halts rice exports as world food prices climb', ABC News (Aust. ), 25 April. Retrieved on 28 April 2008. ^ IRIN 2008, 'CAMEROON: Lifting of import taxes fails to reduce food prices', 29 April. Retrieved on 30 April 2008. ^ IRIN 2008, 'Cameroon: Food self-sufficient in two years? ', IRIN, 25 April. Retrieved on 27 April 2008. ^ "Côte d'Ivoire: Food Price Hikes Spark Riots", AllAfrica.com, March 31, 2008. ^ Al Jazeera 2008, 'Manila urges end to rice export ban', Al Jazeera English, 29 April. Retrieved on 29 April 2008. ^ Al Jazeera 2008, 'Food costs spark protests in Senegal', Al Jazeera English, 27 April. Retrieved on 27 April 2008. ^ "Food riots rock Yemen", The Intelligence Daily, April 4, 2008. ^ Cereal prices hit poor countries, BBC, February 14, 2008. UN warns on soaring food prices, 17 December, 2007. ^ World Bank tackles food emergency, BBC, April 14th, 2008. ^ UN Sets up food crisis task force, BBC, April 29th, 2008. ^ Brown, Lester (May–June 2011). “The New Geopolitics of Food”. Foreign Policy. オリジナルの24 June 2011時点によるアーカイブ。. https://foreignpolicy.com/articles/2011/04/25/the_new_geopolitics_of_food?page=full 2011年6月7日閲覧。.